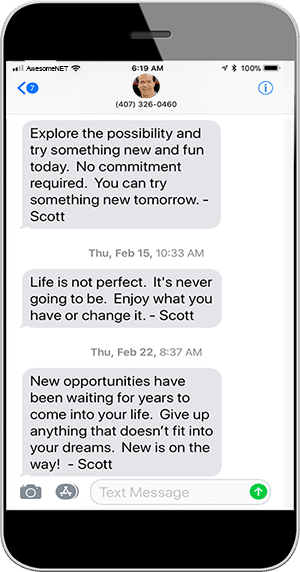 Daily Clicks SMS are what we call our 'Short Motivation Service.' We send one of these short gems directly to your smartphone every morning at 8:30 AM in your timezone. You love the quick boost that you'll get when your Daily Click arrives. Your best life is built on a sturdy foundation. Make sure you can eat, pay your bills, feel safe and have friends. Then you can change the world. If you want something different in your life, stop waiting for it to arrive and PUSH into existence. Emotional triggers often lead to apologies. Catch yourself in the process, re-route your thoughts, and your day is going to get better fast. Put your head down and dedicate yourself to reaching your goals. Nothing and nobody else matters. It’s up to you. That’s the way it’s alway been. Most folks focus on what is in front of them. Happy people on what is inside of them. Start your 7-Day Trial for access to our library - plus we'll send a new one directly to your smartphone every day.